Attorney General Josh Shapiro joined 18 other states suing U.S. Education Secretary Betsy DeVos over her decision to rescind the Borrower Defense Rule. Shapiro is joining the Attorneys General of Massachusetts, California, Connecticut, Delaware, Hawaii, Illinois, Iowa, Maryland, Minnesota, New Mexico, New York, North Carolina, Oregon, Rhode Island, Washington, Vermont, Virginia, and the District of Columbia in the lawsuit filed in U.S. District Court in Washington. 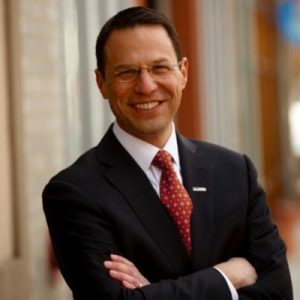 “Rolling back student loan protections harms Pennsylvania college students and their families. With a rising number of students burdened by college loan debt or in default, this is exactly the wrong time for the Department of Education to abdicate its responsibility to protect students from deceptive practices by these for-profit schools. If Secretary DeVos and her Department won’t protect our college students, I will,” Shapiro said in a release announcing the lawsuit. The Borrower Defense Rule provides protections for federal student loan recipients by allowing them for have their debt forgiven if the school they attended used “deceptive practices” including misrepresenting job placement rates. The lawsuit is the latest use of the courts by Democrats and those opposed to President Trump’s policies to use the courts to prevent his agenda from becoming law. The fastest way to reduce the cost of anything is to stop subsidizing it. Of course Shapiro is only doing this to pad his resume when he runs for something else, but why isn’t he suing the colleges who keep jacking up their tuition rates? Congrats to Josh Shapiro for joining the Resistance to the godawful Trump agenda of returning USA to its pre-civil rights days when only rich white people could get college educations and be in charge of everything. That’s pretty contemptuous of the base’s intelligence and plays only to anger. Let’s see how it works out. So college wasn’t ridiculously overpriced before Trump came along? More partisan political grandstanding from our inexperienced Attorney General. Another bullet point to put on his resume for Governor. That is because we federally guarantee these loans in the first place, or give Pell grants, etc. Abolish the federal Department of Education and these problems will go away — and education will be returned to its Constitutionally appropriate state-level control. I know you don’t give a damn, but that would knock many working class and poor kids out of getting a college education. Why are we always working to forgive debt when what really needs to happen is dramatic cuts in the tuitions that colleges and universities charge? Every independent study in the country shows that college costs have risen far, far beyond the rate of inflation. Maybe if some of these universities actually stood up for students instead of working to line their pockets and cave to the unions of their professors tuition rates could come back to earth…and the debt students/graduates carry could become reasonable again. Of course, that would make sense so the politicians won’t fight for that.